NY hip-hop rap artist ‘The King of the Heights’, Minus P, is offering his latest release "The Best in the Heights vol 1.5 - the Parade Editiond" for FREE download. Yes the on the grind hip-hop artist from New York/New Jersey seems never to rest, and he is always keeping his fans in mind. Known to the hip-hop underground and his fans as ‘The King of the Heights’, Minus P always has his fans in his heart and this free download is for all the fans. So if your not a fan of Minus P, go check this out and see what the hip-hop underground has known for some time now. This rap artist is not only ‘The King of the Heights’ but he is always coming strong to the entire hip-hop community. Minus P’s "The Best in the Heights vol 1.5 - the Parade Editiond" is hosted and with some production by Higher Than Man (Producers for Purple City/Nucci Reyo/G Unit/Terror Squad) this is a sure banger! 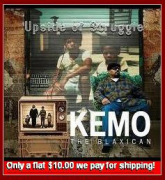 Also catch Minus P in the Puerto Rican Day Parade in N.Y. repping for Safari clothing, for which he is a spokesman, and handing out copies of this CD with the Washington Heights Team! ALSO ADD MINUS P ON MY SPACE IF YOU GOT AN ACCOUNT! Support those who support real Hip-Hop, and support Minus P who is always watching out for you and the entire hip-hop community.